In light of the resignation of Hosni Mubarak, the victory of the protestors in Tahrir Square, Cairo and the outburst of joy from what seems to be the whole nation of Egypt, I wanted to write something in response to previous posts and thoughts looking forward to Egypt’s future. During this past season of protest in Egypt I received several emails from different believers in Egypt so that we might join with them in prayer (obviously after the online restrictions were removed). Most of these messages were from individuals that I personally know. The email of the skewed Western media perspective was not from an individual I personally know, however I did receive it from a trusted friend, who verified the identity and credibility of the sender. A number of people have contacted me since then to say that this was essentially a pro Mubarak government communiqué and therefore of no credibility. After learning the identity of the source, I do not believe that it was a govt communique, and that is the reason I kept the post on my blog. I do think that certain details in that email were exaggerated and wrongly interpreted, however I think this is a more a mixture of wrong analysis and personal opinion rather than intent to deceive – again this is just an opinion. The main reason I kept it on the blog however was that it spoke of another side to the protests, which was contrary to the mainline media and a side that we must be aware. The reason that Mubarak was able to stay in office so long with all of the attending corruption was that he was able to convince the US that he was a better alternative to anything or anyone else. In a nation where 90% of the population are Sunni Muslim and only 10% are either Coptic or Christian, and with some of the most developed Islamic training in the world, the delicate peace situation with Israel is something to be considered, as is the very real possibility of a Theocratic Islamic Government taking control in Egypt. So what is the future for Egypt. It seems that everyone is now celebrating the departure of Mubarak and rightly they must, he came to exemplify the corruption of an evil regime. Corruption and greed are hard to eradicate as they are inherent in the fallen human state, but when they are deposed we must celebrate. The hardest challenge ahead for Egypt will be to replace a corrupt regime with another government that is not as corrupt. This will be a challenge, not because Egyptians are intrinsically worse than the rest of humanity, but when a society lives a certain way for a long time intrinsic change is hard. This is why the citizens of Cairo turned to the same hated Police tactics of searching and stopping suspected looters that had been so denounced. The handover to the military is a decent interim solution that will please most, however there must be a process set in place for free and fair elections. 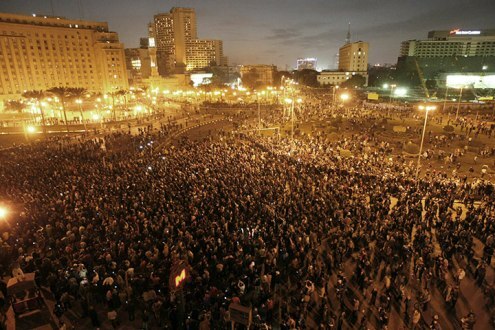 But even with free and fair elections, the society that the social media democracy protestors envisaged will probably not come to pass, with the Muslim Brotherhood and El Bareidi being the only seeming alternatives at the moment the future for this great nation of Egypt really does hang in the balance. The election of Hamas in the Palestinian Territories was not unexpected due to the heady mixture of Islamic rhetoric, poverty and violence. The situation in Egypt is markedly different, but it is still unclear at the moment whether a secular political candidate would garner more support than a candidate from the Muslim Brotherhood. We could speculate more – but now is probably just a time to celebrate the end of one corrupt regime and pray for future of Egypt and that this change might provide an open window for the Gospel of Jesus Christ to go forth in the land of Egypt. This entry was posted in In the News and tagged Egypt, Prayer. Bookmark the permalink. Well said, Jono. Thanks for clarifying your position on last week's post. I wasn't writing to discredit Rafik's observations, just trying to make the point that so much attention was given in the charismatic world to one unverified email which blatantly contradicted tons of overwhelming evidence from the unfolding scene in Cairo. As you said, everyone is certainly entitled to their perspective and opinion, but we still need to be responsible stewards of truth… especially if we are publishing those opinions and calling them revelation from GodAs a firm believer in the prophetic word of the Lord, I do check in from time to time to see what some of the respected prophets are saying about world events. Living as I do in a Muslim country, I have a keen interest in what God might be saying about my part of the globe. Sadly, much of what is coming out of the prophetic movement in the West is based on inaccurate perceptions and simply irrelevant to this context. It's my hope that through the influence of IHOP and a greater participation from international voices who have not been enculturated by contemporary charismatic Christianity, that might change. Keep strong Jono… Grace and Peace!